“We grew up in Brookline, Massachusetts, a suburb of Boston, where we were trained in Classical music from a young age. But we also loved the 1950’s recordings by jazz bassist Oscar Pettiford and jazz French horn player Julius Watkins; and those have remained influential, even as we went on to other playing. The catchy melodies, deep grooves, and tight solos made that music memorable, and it’s been percolating for years for us to do an album of our own in that style. 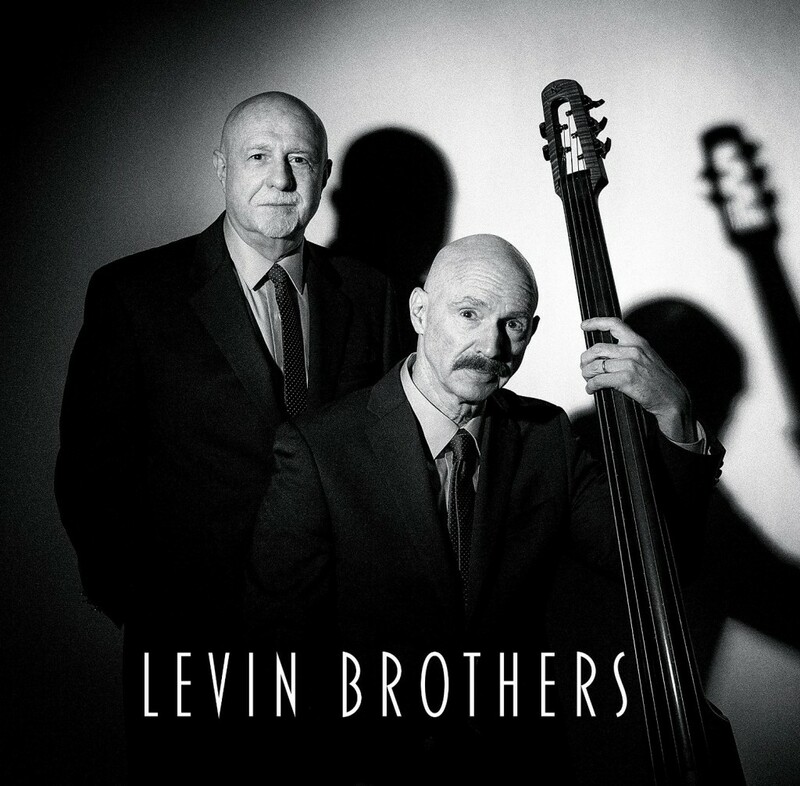 “The two of us have crossed musical paths many times over the last decades, having toured together with Paul Simon, and played in each others groups and albums; but we’ve never done a Levin Brothers album ’til now, and it’s pretty special for us. “The sessions took place at Scott Petito’s NRS Studio, in the Woodstock area where we live. The material is all our own, all new compositions except the lovely King Crimson song, “Matte Kudasai.”Because we kept the songs short, there was room for a lot of material on this release; the CD has 14 tracks plus 2 exclusive bonus tracks. “Another long time wish that’s come true with this release – a vinyl LP version of the music. We’re told that ‘Vinyl is coming back’ and we’re ready for that. In pre-orders, we’re offering a special limited edition LP (1,000) with unique colored vinyl, each signed and numbered by us. The LP has 12 tracks, with a card enclosed to digitally download the CD’s 14 tracks. We’ll also be autographing the first 1,000 CD’s ordered. 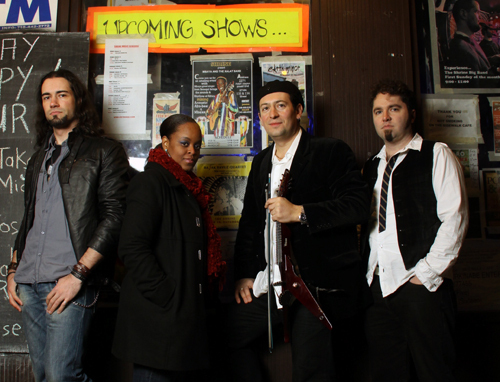 Stratospheerius members are Joe Deninzon-electric violin/mandolin/vocals), French guitarist Aurelien Budynek (Cindy Blackman, Vernon Reid), bassist Jamie Bishop (The Syn, Francis Dunnery), and drummer Lucianna Padmore (Primordial Jazz Funktet). Joe Deninzon & Stratospheerius are releasing four singles throughout 2015, culminating in a full-length album in 2016. The songs will be available for downloads and streaming. First song is “Behind the Curtain” written by Joe Deninzon. Stratospheerius’ musical range combines progressive hard rock with elements of jazz, “fiddle funk,” and Gypsy influences. The group was a winner in the John Lennon Songwriting Competition, won the Online People’s Choice Awards in the Cornucopia Festival, and was named “Best Jam Band” in Musician’s Atlas Independent Music Awards. The band has recently been profiled in both PROGRESSION (the Bible of progressive rock) and DOWNBEAT ONLINE. The band is on the soundtrack of the Will Ferrell/Adam McKay-produced movie, VIRGINITY HIT. Joe has written the book on Electric Violin–literally; Mel Bay books has released his “PLUGGING IN: A Guide To Gear and New Techniques for the 21st Century Violinist.” Joe has been called “The Jimi Hendrix of the Electric Violin,” because of his innovative performances on the electric seven-string violin. While leading Stratospheerius since 2001, Joe has worked with Bruce Springsteen, Sheryl Crow, Les Paul, Phoebe Snow, and Ritchie Blackmore, and perfrmed for President Clinton. He can be heard on over 100 recordings and jingles as a violinist and string arranger. He is writing his first electric violin concerto to premiere September, 2015 with the Muncie Symphony Orchestra.